f to the mf unky! Very nice! With a great funky tune. The gfx, for its part, is not a top notch (imo), but well. OK'ish here. Hope to see more from you, dudes! A bit short, but really nice. Who else immediately thought of Spaceman's Lemonade mod when seeing the title? :) Funky fresh boys are back! I liked the stencil vector part - a standout for me. Virgill's track is great, but the strange high pass filter applied to audio in videocap ruins it... Fix it please. Very pleasant sound and transitions ! Short but sweet, nice design. wow! I like it a lot. has the certain lemon design to it and felt very polished, yet a bit short. Great work guys, so nice that Lemonade is finally finished, Looking forward to the final version. Keep pumping up that good stuff! Watching this, it's hard to believe its been 20 years. Rewind back to late 1992, and I started working on a Lemon. demo to release at The Party 2 in Aars. Lemon did not officially exist at this point, and it would be several months before we finally announced it in early 1993. 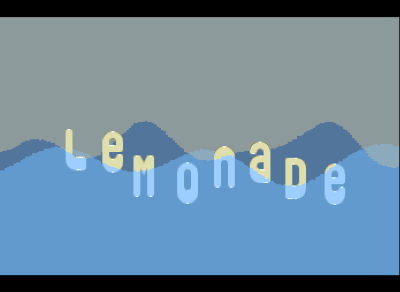 Music for the original version (mod.lemonade) was composed by Nuke for this demo, but unfortunately work got in the way, and I was unable to finish it. Around 2012, I found an old backup disk with the unfinished demo on it, and started to import it part by part into a new demo system that I had started working on based on a WinUAE / Visual Studiio / VASM set up. I then proceeded to try and improve and fix some of the existing parts. Fast forward to Late August 2018, and Facet came over to the UK for weekend of partying with me.... we drank so much that we should actually be dead now (but that's a story for another time)... Facet started working on logo, and I started to knock up a new effect, with the intention of releasiing a small intro... this developed into a mini demo idea.. we had asked Virgill to do the music, and he oblged, with a really funky chip tune. It was then that I made the decision to dig out the Lemonade code again, and start re-factoring it, improving (fake phong?) and making transitions, and making it sync to another new house style tune that Virgill had created for us. I also had the chance to finally code a couple of things that I had had on my mind for some time (the cube splitting into waves, and the perspective greets scroll). Soundy came on board, to help with some transitions, and another part for the demo, and I asked Made too if he would like to contribute something. So overall I am happy, and unhappy at the same time.. happy that I managed to get a release in the compo, but unhappy that I had to cut some parts, and make it a lot shorter than was originally planned.... lessons learned for next time !! Apologies to Soundy too, as one of the parts I had to cut was his, and he had been working on it for a while, so he only had one transition effect in the compo version. Really nice and everything looks great and polished. I actually like this better than "The Fall". Great demo, and thanks for the interesting writeup! Looking forward to the final. great demo, love the design! waiting for the final version! Cool tune, cool design! Love the oldskool vibe. Deliciouse design / transitions and ossom soundtrack. Good work! Man, this is soooo good. Truschool! Always fond of stylish stuff. Very enjoyable demo with smooth design and groovy music. So cool to see Lemon on the Amiga again. Especially loved the jazzy music at the party. Fitted the visuals and was fun to watch! jelly vectors have always been my favourite. needless to say, with all the hype built up throughout last few months (e.g. several people telling me that this will be "the best a500 demo ever"), I was somehow expecting more. This would be the definition of boring mediocrity even in 1991. Lemon used to do way better back then. Thumb for finally getting it out. This one is nicely synced. Looking forward to the final. And would love to see the source behind the jelly animation which has always made happy already back then. rulez added on the 2018-10-11 23:50:39 by JAC! Nice logo. Simple effects, but smooth and well synced. Really love it! Brings you back to the days when demos consisted of cool effects and wonderful transitions. Great work! At first I was like "Why would you have a non-ironic vector cube..." And then I was like "Oh." Really better than the fall, the real Lemon style! I wondered why this feels soooo LEMON.ish at first, then i realized it´s Lemon. P.S.2: Children we can haz? pwetty pleeze?!! ? ?? just some introductionary children maybe, nothing i´d demonstrate! ^^ :D HAHA! (this was fun to me, hope it´s atleast a bit funny at all to anyone else! Although THIS sounds really nice to me in hindsight: "hArDy./Lemon." ♥ -> just rotate it around and you get "lemonhardy"...every frenchman would say "lemonadey" then! :D) -> ever realized there´s a PUNKTUM behind my name, just as in LEMON POINT? rulez added on the 2018-10-16 00:41:47 by ɧ4ɾɗվ. it's all said. quick rehash : smooth, funky, style, groove, clean. lovely! Love it. Looking forward to the final. And although obviously this is much shorter etc but I agree with the people who said they liked this more than the fall. It felt a bit short but it was sweet and tasteful :). mmmh i must be spoiled by modern C64 stuff, but this doesnt have the "wow" factor for me. thumb for the music, the smoothness, the design, the writeup and Hardy's comment! Full of 1992 vibe, and fresh at the same time. Looking forward to the final version! Smooth soundtrack and awesome effects! Loved when the glass was hit ! Forgot to comment. awesome demo. just the way I like it. Looking forward to the final version, I hope it will be longer. Love the groovy music, some samples are a bit noisy than I'd expect but the overall performance is astounding. The breath of the 90's is self-evident. Thanks for this, it's another gem between modern A500 demos. Besides the obviously awesome effects I'm a total sucker for the attention spent for transitions. As said on the party, I'm sure I'll watch this many more times on my amiga! Splendid stuff. Already more than enough for a thumb up. Still, looking forward to the final! Pro production but left some sugar. Waiting the final copy. Apologies for not getting a final version out yet... real life struggles have taken over as usual... hopefully very very very soon!!! But thanks for all the awesome comments!! So nice to read!! Reminds me style of latest DHS' prods. But on Amiga. Nice and not too short. Waiting for final. I've been waiting for the final, but now I got impatient and watched the party version! Super nice, love the demo-feeling and the transitions etc. Now I really want that final! Funktastic work guys! And Virgill, superb amiga soundtrack! Awesome! Great design and real fun to watch! warm music, chill graphics. It's nice, could have done with more. Nice demo with fresh music and some good effects. The wobble-part (which can be seen from minute 0.24 - 0.36 in the youtube-video) seems to need a higher kickstart, cause it don`t work correct on Amigas with Kick1.3. Could/should be changed for the final version. Seemed, that i could localize the problem. When a user has Kick1.3 and four floppys on his A500 activated (like i had here), then the wobble-effect is destroyed, no matter how much memory the user seems to have. Turning off fourth floppy (DF3) solved the problem, then the wobble effect works normally. So, DF3 in combination with Kick1.3 makes trouble here. Can be reproduced also with WinUAE or Minimig, exactly the same behaviour then. nostalgic style. I like it. page created in 0.032087 seconds with 15 queries.